All young student is expected to at least do their study, yet this kind of expectation is usually untenable to the young student, for what matter to them is to be free to play and to eat when they are hungry; and they seems to be always hungry. The years of my schooling pasted without much significant events, a few here and there, with the exception of one normal incident that turn out to have leaved a permanent impression in my life. It was normal as a student of class IV in a Chinese school, to be given a chapter to learn by heart as home task. On that particular occasion, most of my classmates did what we usually do. I, on my part did not even turn the book. Next day, our class teacher promptly calls us up to find out whether the task was comply with. Soon he found many of us wanting. The defaulters were punished by a few strokes with a warning that it should not be repeated. If it were repeated in the future a tougher punishment would be given. When my turn came, I was also found wanting. Instead of getting a few strokes of canning which should be painful I was spared. I was told to knee before the big photo of our National Father till I am told to get up. Time passes slowly, and it became more and more uncomfortable as it dragged on. After one period of class it had become embarrassing, at the second period it had transformed into shame. Finally, I became the most noticeable shameless student of the class. When I found it nearly unbearable, I picked up enough courage to ask my teacher for the reason which merited my special punishment. What happened, till today, his words rang out loud and clear as it was yesterday, although it happened some 60 years ago ? I was told to have a good look of the image of the person in the photo and identify him. 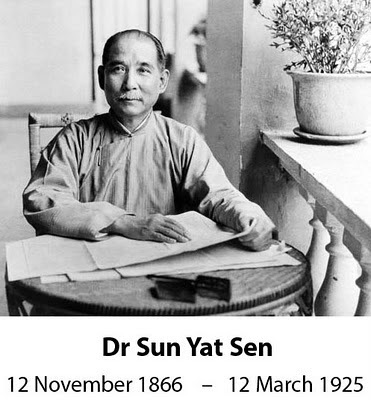 I acknowledge him to be none other than Dr. Sun Yet-Sen, the National Father of China, It did not make any more than that his was responsible for the overthrowing of Qing Dynasty. Then the teacher told me firmly that I ought to be ashamed and apologies to this great man who had sacrificed so much for the liberation of our nation. For I have not even care to use the talents that I have and have not even try to be a person I am to be. It is a shame for anyone who do not develop oneself and to be of service in the world we live in. Somehow I could not help but to start to feel the shamelessness, worthlessness and uselessness. Tears soon followed, and with my teacher’s gentle prompting I made up my mind to do my best in the future by following his example of selflessness and perseverance in doing what I am born to do. From then onward I never failed to do my best and in the best of my ability. Looking back, I realized on that fateful day I was touched by him whom I hardly know personally, but was so overwhelmed by his personality and example. On recalling what happened that day, when he had touched and changed my attitude of life. I am proud and grateful to the Almighty for Dr. Sun Yet-sen and my teacher who cared and took the interest of the student’s future. I thank them for evermore. PS : Dr. Sun Yat Sen was born on 12-11-1866 in the village of Cuiheng, Xianshang county, Guangzhou, Guangdong Province, China; which is 26 km north of Macau. But a certificate of birth issued by Hawaii that he was born in Kingdom of Hawaii on 24-11-1870, but the claim of Hawaii birth was based on typewritten testimony, and without any documentation from witnesses. He died on 12-3-1925 after illness in Beijing, China.